WE'RE not going to lie, there are times when we have breakfast for dinner. Especially during the warmer months when we just can't be bothered getting into the kitchen to create something for the two of us. I'm sure we are not alone. This week we share with you our recipe for roasted peaches. When you roast fruit, the sugars come out and it becomes tastier than before. You don't have to eat them hot. Allow the roasted fruit to cool and enjoy later - they are divine. It's a simple different idea to serve up over the Christmas holidays for friends, family or visitors. METHOD: Preheat oven to 180 degrees. Line a flat tray with baking paper. Place the peaches on the tray and top with honey and thyme. Roast in oven for 15-20 minutes. Next, combine the mascarpone, icing sugar and vanilla pastel in a small bowl and mix well. Toast brioche slices in toaster until lightly toasted. 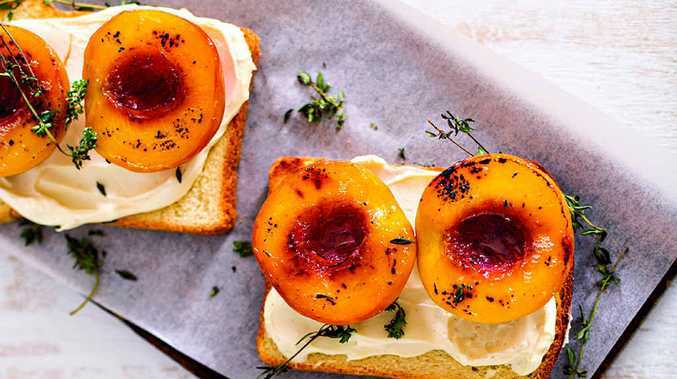 Spread the vanilla mascarpone over the brioche, top with roasted peach half, drizzle with a little more honey and some fresh thyme - serve immediately. Dan and Steph Mulheron won My Kitchen Rules in 2013. Visit http://www.danandsteph.com.au.